State Bank of India or better known as SBI is one of the government owned bank in India with really high number of assets and stake in Indian banking industry. Millions people from India have account with this bank, and they (SBI) offer all kind of banking features to their customers from debit card to demat account every banking need to covered by them and that is why people like them. But yes we hear complaints on few websites and generally people talk that the staff of SBI is not co-operative. At some point of view I mean in some of the branches of the bank it’s true because the bank officials don’t know how to cooperate with their account holders. But don’t worry after reading this tutorial you will not face any discomfort in your home branch. Then let me tell you that once you activate internet banking in SBI you will be able to do most of the banking tasks from home. Sounds great right? Yes it does generally we go to the home branch because to transfer money from our bank account to other bank account, link your Aadhaar card, open fixed deposit, open public provident fund account etc. But with internet banking you can do these things online from your home. All you need to have is a desktop computer or a laptop with a reliable internet connection. In this article of mine I will tell you the complete procedure which you need to follow to activate internet banking in SBI. You should have few things ready with you before we can proceed to the further part of this guide and I have listed them below. Make sure you have these above-listed things ready with you before you proceed to the further part of this article. 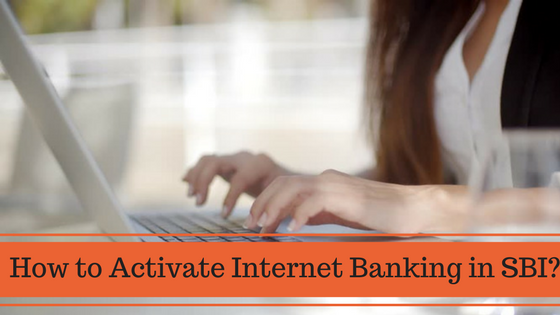 So now let us get started with this guide and check out the procedure which you need to follow to activate internet banking for your savings or current account which you hold with State Bank of India. The first thing you have to do is open the official website of SBI: https://www.onlinesbi.com/ and click on New User Registration button, you can refer the image embedded below. Now you will get a form which you have to fill, I have added a image below in which you can see the online from. But please make sure that you don’t use this form if you have already received your User ID and Password along with your welcome kit. If you have received them then you can directly login using those credentials, when you login with those for the first time you will be asked to create new login and profile password and you are good to go. In case you have not received Username and Password then you have to fill the form which is shown above. Account Number: Enter your bank account number which you will find on the first page of your bank passbook. CIF Number: This is acronym for customer information file number you can find it above your account number on the first page of your passbook. Branch Code: The code of your home branch. 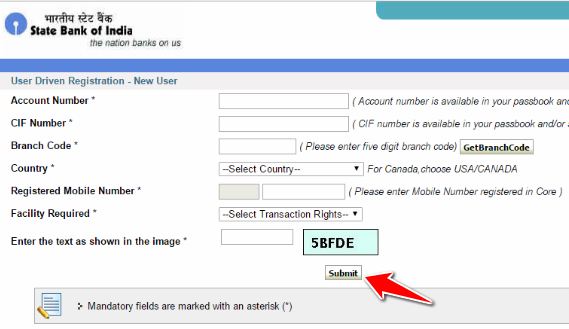 Country: Select the country in which you hold SBI account. Registered Mobile Number: Enter the mobile number which you have registered with your bank account. Facility Required: Select the facility you want to activate. Enter the Text Image as Shown in the image: Enter the text which you can see in the small image beside this field. And at last click on the Submit button, once you click on that button you will receive an OTP on your registered mobile number. Enter that OTP in the space provided in the new page which you will get after click on Submit button. Once you enter the OTP you will be asked to set login password and profile password and you are done with it. This is how you can activate internet banking in SBI, I hope you got all the steps mentioned in this article. If you are facing any difficulties then you can contact customer care of the bank they will assist you further.